required the transformation of a one-story wing of an L-shaped structure in order to accommodate a larger dining room. The replacement of the existing roof over the lower part of the house was also required. The design process involved critically examining the virtues and vices of the existing conditions jointly (i.e. the building in relation to its exterior spaces, the surrounding context, etc.) and creating a design that responded accordingly. The final outcome of various meetings was the simple reorganization of interior partitions defining the homes public spaces, in order to maximize the usable space. This would minimize the amount of new construction to a 93 square foot addition at the rear of the house and allow for the maintenance of the single story character of the neighbourhood. The footprint of the existing exterior walls were to remain unchanged while the deteriorating roof was being replaced. space, defining all of the public functions – kitchen, dining, living, and entry. These spaces were to be further defined by freestanding storage units. extend higher that the highest roof line – in this case, approx. 10 feet above the lowest roof. This was looked upon, not as a constraint, but as an opportunity to create a unique feature that could define the individuality of the house and its users, while respecting the existing context of the neighbourhood. Although its physical manifestation was unclear initially, building permit drawings were created (and accepted) based on these semi-refined ideas – ideas that were to be refined, articulated, and finalized as the construction process took place. The early stages of the construction created unforeseen circumstances. 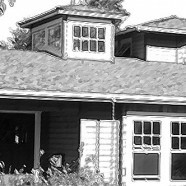 The structure of the earlier additions done to the house turned out to be a jumble of poor construction and rot. A mutual decision was made to demolish the building envelope surrounding the public spaces and rebuild it properly along the buildings existing footprint in order to limit the new construction costs. In seeing the possibility that such poor thermal and structural construction could be present in the rest of the existing structure, it was agreed that the best solution involved compartmentalizing the new wing containing the public spaces from the rest of the house. On a more positive note, this facilitated the reconfiguration of window openings in accordance with natural light requirements and solar orientation. framing was used at the front and rear of the house to facilitate future expansion. Covered porches create intimate transition zones between interior and exterior, at both the front and back of the house. Large 2 foot overhangs ensure adequate protection from the rain that is common in the region. space, the other following the ceiling line above the ceiling height – allow treetop views and the penetration of cool, consistent north light into the interior. A large, 16 inch deep picture bay window was created on the east facade looking from the dining space into the backyard. Not only does the bay provide a dramatic visual connection to the intimate and beautiful garden space at the rear, but also, it allows the refreshing morning light to be reflected deep into the space of the house and creates a sitting space – at once separates and connected – in which one can relax and enjoy the interaction of all these elements. Furthermore, the inclusion of this feature transforms the dining room into a platform from which to enjoy the natural landscape beyond. On the west facade, where protection from the overheating sun and privacy from the main street were required, the response was different once again. The windows were reduced in size and increased in texture. Low-emissivity glazing was also utilized. Six inches of depth was added to the window opening adding three-dimensional texture to the facade and creating a shelf space where the Murrayâ€™s cats can rest in the afternoon. months. All dimensions and heights of the openings as well as the window types were chosen according to their location and use collaboratively. A large clerestory box – with one operable window – is the dominant feature of the new roofline and the buildings built form. Its multiple purposes make it the most complex, inspiring, and whimsical feature of the project. At once, it houses the fireplace pipe, acts as a stack for natural ventilation in the summer months, and provides energy savings through maximizing natural light at the center of the house where it would other wise be dark, reducing the need for artificial lighting. Its height above the roof was based on the penetration of direct sunlight into the interior throughout the winter. Furthermore, it recalls the ridge vent structures adorning the rural buildings of the agricultural lands surrounding Tsawwassen and that have been used in rural architecture world-wide for centuries. Most importantly, however, the clerestory creates a qualitative interaction between those inside the space and the greater regional natural system embodied in the changing atmospheric conditions outdoors. Interior and exterior materials were chosen to enhance the buildingâ€™s unique physical qualities while integrating the existing house and the larger street context. Recycled fir flooring was used throughout the interior. Similarly, rough beams, originally used as a part of the original structure, were planed and reused as the beams over the front porch and for the mantel and base of the fireplace. These accents serve to tie the building to its historical roots. The physical reality of this building renovation is a sum of the open-minded, collaborative effort of all the parties involved in the design-build process.